Microsoft has released KB4345419 cumulative update for Windows 10 Creators Update Version 1703. After installing this update, the complete build number of Windows will become 15063.1208. As always recommended, you should always keep your system up to date. Please note that Microsoft has already released a new version of Windows 10, Windows 10 Version 1803. If you have already installed Windows 10 Version 1803 then you may install KB4345421 instead of this update. Let’s go through some of the issues fixed in this cumulative update. The fixes are almost the same as provided for version 1803. If you have installed the earlier July update and running any network monitoring workloads, you may receive a 0xD1 stop error. Installing this update will fix this issue. If you are running SQL Server and are receiving the error “Tcp port is already in use”, please install this update to fix the issue. W3SVC malfunctions when you want to stop or restart the service. This issue has been fixed in KB4345421. There are two ways to get this update, either you can get it through Windows Update or you can download and install it manually. To download and install this update through Windows Update, please go to Settings –> Update & Security –> Windows Update and select Check for updates. If the update doesn’t show in Windows Update then you can download KB4345419 from below given links and run the installers for installing the update. Before installing any Windows Update, it is always recommended to create a restore point for your safety. This should be the default case before installing any update or software on your system. At the very least, if the system get bricked after installing an update, you will be able to revert back to the working point. To create a restore point, go to Run –> systempropertiesadvanced. 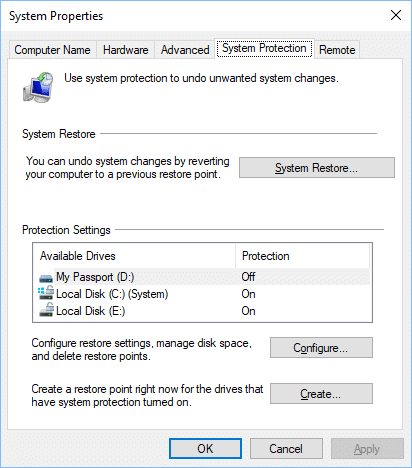 On the System Protection tab, enable System Restore and create a restore point manually.